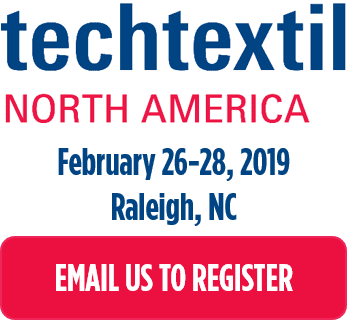 We will be exhibiting for the first time at the 2019 Techtextil North America show (#TTNA19) in Raleigh, North Carolina. This show will be held February 26-28 at the Raleigh Convention Center. Join your peers as they discover the latest innovations in technical textiles and nonwovens! You can find Tennessee Webbing Products at booth# 1322. We’ll have samples available of our extensive product line of seatbelt webbing, polypropylene, cargo webbing, and specialty webbing. Danny Cox, International Sales Manager for Tennessee Webbing, explains the importance of our presence at this show. We see our presence at Techtextil as another chance to meet face to face with regular customers and friends in the industry. Since this is our first time exhibiting at Techtextil, the most exciting part is that this is uncharted territory for us. We are eager to explore new opportunities this show may have to offer. We have a limited number of free registrations to offer so be sure to reserve yours today! The official free registration code for TN Webbing will arrive soon. Contact sales@tnwebbing.com if you would like to be placed on the list to be notified when free registration opens.